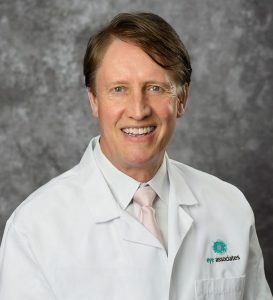 Dr. Curtis Jordan received his Bachelor of Arts degree from Indiana University and his medical degree from Indiana University School of Medicine. After completing an internship at Methodist Hospital in Indianapolis, he also completed a residency in Family Practice and was Chief Resident. Dr. Jordan completed residency training in Ophthalmology at Kresge Eye Institute in Detroit, MI, before joining Dr. Black’s Eye Associates in 1995. Dr. Jordan says he values his time as a family doctor, but being able to practice ophthalmology at Eye Associates for the last twenty years has truly been a gift. His daughter is completing her undergraduate degree at Asbury University and plays on the soccer team. They sneak away for “Father-Daughter” vacations on a regular basis. Dr. Jordan also loves “all things IU” and enjoys heading up to Bloomington whenever he can. He took up guitar as an undergrad at IU and has played around at that ever since.